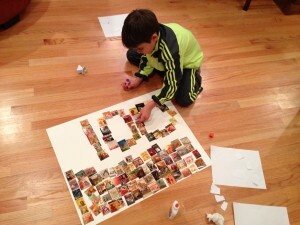 My son’s class was celebrating 100th day of school and the assignment was to put together 100 of anything in some fun way. We decided to take photographs of 100 books that he has read, and arrange them on a poster board. Henry laid out the books, I shot the pictures with my phone, uploaded to a local pharmacy photo printer, and an hour later we had the pics. Henry cut out a picture of each book, with a little assistance, and then he played with various arrangements. He found his favorite and got busy gluing. He was mighty proud upon completion of this project and loved talking about it at school.